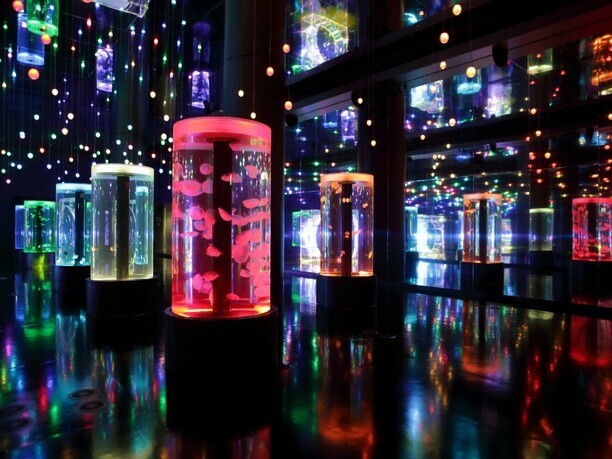 Luxurious entertainment with sound, light and videodecorate the world of the sea! Epson Aqua Park Shinagawa just reopened on July 10, 2015 (formerly the Epson Shinagawa Aqua Stadium.) It is conveniently located. Just a 2-minute walk from Shinagawa Station (Takanawa Exit.) The new and improved show is very popular. It is a wonderful production that combines sound, light and video into an exciting showcase for the seas of the world. The program changes every season and is a little different every day, so you can enjoy the show over and over again! A Colorful production appears in an instant. As you enter Epson Aqua Park Shinagawa you are transported into another world. You are greeted by colorful fish and the images that are projected onto the aquarium. 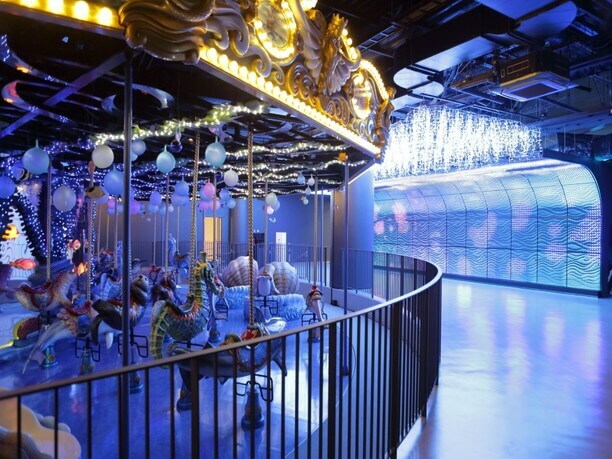 The production makes full use of the technology, LED lights and music, all incorporated into a merry-go-round that you can ride for an additional charge. 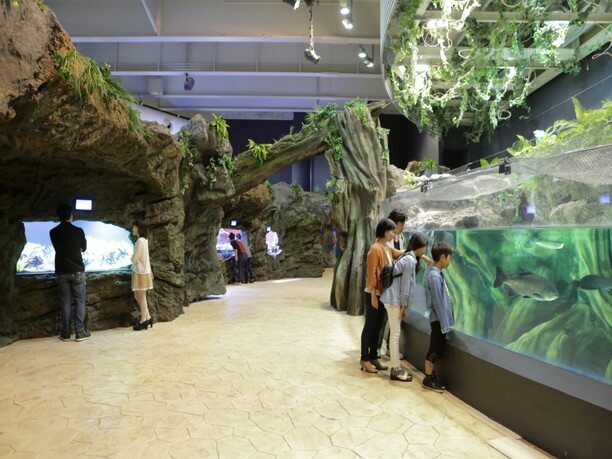 There is also an opportunity experience the world’s first transmission-type liquid crystal panel that when you touch the water tank you enjoy making a connection with the fish. If you get thirsty, there is a cafe-bar with a fantastic atmosphere. It is ok to walk around with your drink. Another attraction is the large (35-foot-wide 115-foot-deep) tank where you can watch slowly swaying jellyfish. Always something new to see! On the upper floor, there is a 65-foot long sea tunnel. It is actually a water tank. and they often change what is inside. You will most likely be greeted by manta rays as you enter the tunnel. As you make your way through the tunnel you will be able to see penguins and seals. As you continue on in the Epson Aqua Park Shinagawa you will come to “The Stadium”(a 360-degree circular pool.) The cost of admission is included as part of your general admission fee. Here you can see a dolphin performance that is well worth your time! 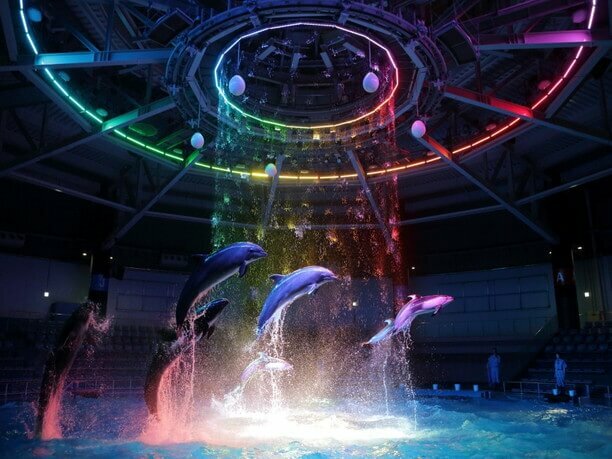 Dolphins perform movements through a water curtain and special lighting. Take advantage of the discount service. If you want to continue the fun into the night, after 5 o’clock you can purchase an “Aqua Night ticket” for 1,800 yen for an adult ticket. 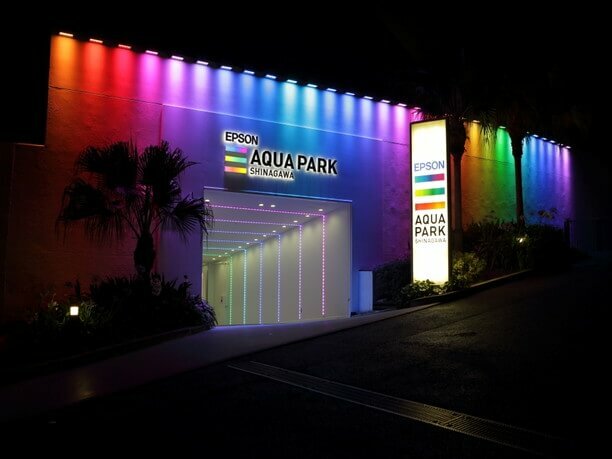 Since Epson Aqua Park Shinagawa is open until 10 o’clock at night, you can take your time and enjoy the show. In addition, if you stay at the Shinagawa or Takanawa area Prince Hotel you will receive a 500 yen discount off the normal adult admission fee of 2,200 yen. 10:00 to 22:00 (21:00 last admission) ※ different by the time of year. NHK Studio Park is a uniqueTV station that is full of fun! Feel free to enjoy the storyteller and more at legendary Asakusa Engei Hall!